Order Goods and Services Figure 13.13, a lower-level view of bubble 1.0 in Figure 13.4, provides a look at the logical functions involved in ordering goods and services. The first process involves vendor selection (bubble 1.1). A buyer generally consults the vendor master data to identify potential suppliers and then evaluates each prospective vendor. Buyers often attempt to combine as many orders as possible with the same vendor by using blanket orders and/or annual agreements. If large expenditures for new or specially made parts are involved, the buyer may need to obtain competitive bidsby sending a request for quotation (RFQ) to prospective vendors. 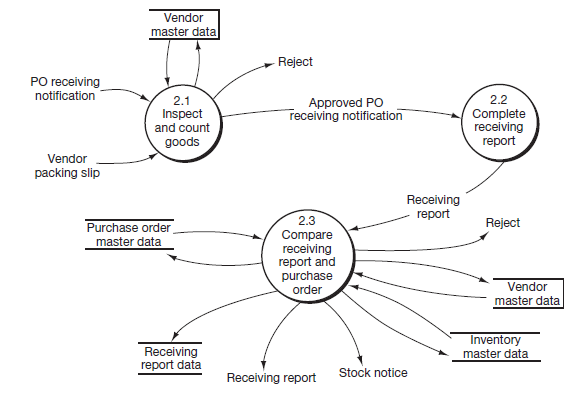 Process bubble 1.2 of Figure 13.13 depicts the process of preparing a purchase order. Process 1.2 first checks the inventory master data to obtain additional information with which to prepare the purchase order. The purchase order data flow out of process 1.2 is sent to the vendor. At the same time, the inventory master data are updated to reflect the goods on order. The purchase order information is distributed to several departments as shown by the four other data flows out of process 1.2. 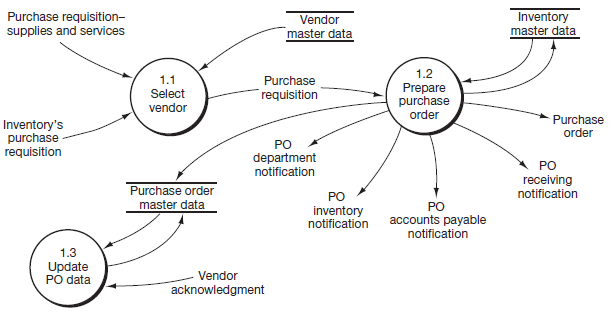 The data flow “Vendor acknowledgment” into bubble 1.3 informs the purchaser that the purchase order has been received and is being processed. As a result of the vendor acknowledgment, process 1.3 updates the “Purchase status” in the purchase order master data. Receive Goods and Services Figure 13.14 is the lower-level diagram for process 2.0 in Figure 13.4 As indicated by bubble 2.1 of the figure, goods arriving at the receiving department are inspected, counted, and compared to the vendor packing slip. Nonconforming goods are denoted by the reject stub out of process 2.1. Notation of rejected goods is added to the vendor service record in the vendor master data. Data about vendor compliance with the order terms (product quality, meeting promised delivery dates, etc.) is linked to the vendor master data. Receiving report data may be accessed by the accounts payable department (i.e., the receiving report) and the warehouse (i.e., the stock notice). The inventory master data are updated to reflect the additional inventory on hand. Finally, the purchase order master data are updated to reflect the receipt of the goods, and the receiving report data are stored. Establish Payable Figure 13.15 presents a data flow diagram for establishing accounts payable. As shown by bubble 3.1, the first step in establishing the payable involves validating the vendor invoice. Process 3.1 comprises a number of steps. First, the vendor invoice is compared against data for the purchase order (PO accounts payable notification) to make sure that (1) the purchase has been authorized and (2) invoiced quantities, prices, and terms conform to the purchase order agreement. Next, the invoice is matched against the receiving report data to determine whether the goods or services actually have been received. Finally, the invoice is checked for accuracy of computed discounts, extensions, and total amount due. If the data items do not agree, the invoice is rejected and follow-up procedures are initiated (see the reject stub emanating from bubble 3.1). If the data items agree, the invoice is approved, and the validated invoice is then used to record the payable. Note that the vendor master data are also updated at this point to reflect purchase history data. Creating a record in the accounts payable master data. Updating the inventory master data for the cost of the items received. Notifying the general ledger of the amount of the payable that was recorded (see the data flow “GL payable update”). Make Payment Figure 13.16 presents a data flow diagram of the cash disbursements process. Remember that the payment process is triggered by payment due-date information residing on the accounts payable master data (i.e., a temporal event). The payment schedule adopted depends on the availability of any favorable discounts for prompt payment and on the organization’s current cash position. Some companies pay multiple invoices with one check to minimize the cost of processing invoices.